Situated on the US side, the American Falls and Bridal Veil Falls are together a popular tourist attraction situated in the State of New York. These famous falls are best viewed from the Canadian side of the border. 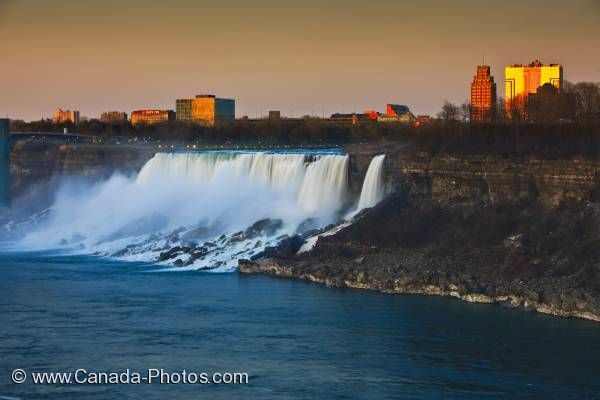 The American Falls and Bridal Veil Falls continue their cascade over the jagged escarpment between while the buildings of the City of Niagara Falls in the State of New York, USA glint under the light of the setting sun. American Falls (located in the State of New York, USA) seen from the Canadian side of the Niagara River, Niagara Falls, Ontario, Canada.